I made the best thing ever that at first I thought I invented and then realized everyone else in the world already invented it: Eggnog Pancakes. I have no idea what made me think of it. Paul and I got some homemade syrup when we visited our friends in Massachusetts and we’ve been planning to have pancakes ever since. Then, I was driving down the road the other day and for some unknown reason was thinking about eggnog, which I’m not terribly fond of. I like the flavor but I don’t like the drinking-something-so-thick-it’s-like-drinking-runny-pudding thing. 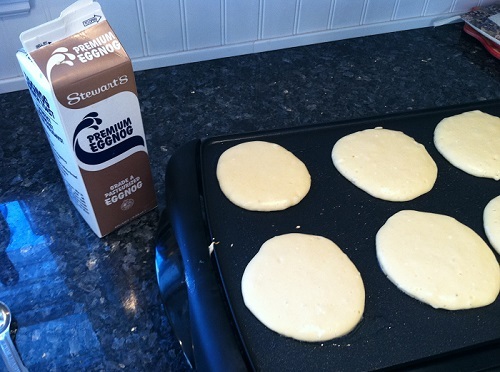 Somehow, I got to the thought of replacing the milk in pancake batter with eggnog. Oh my gosh, they were good. I used my stand-by Good Housekeeping cookbook pancake recipe and literally just replaced the milk amount with eggnog. Easy peasy. You should make some for Thanksgiving Breakfast. Happy Thanksgiving! Posted in Uncategorized and tagged eggnog pancakes on November 28, 2013 by lizytish.